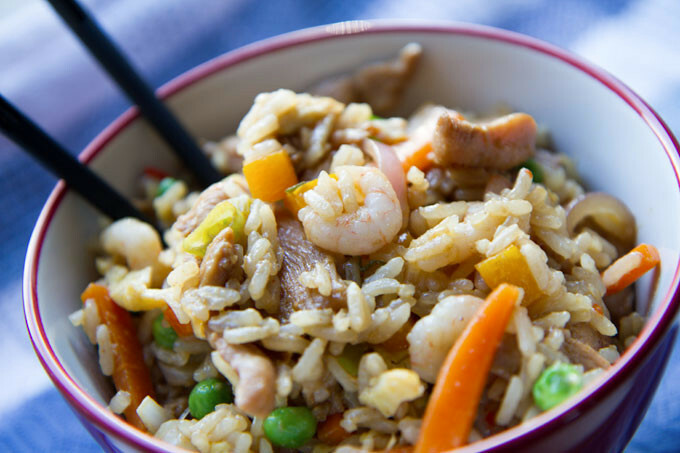 Egg Fried Rice comes in many guises. It is a great thing for using up slightly tired ingredients (not so tired that legs have grown legs and and rogue food items have managed to escape the fridge on their own), and can taste really good. For me, this is a real comfort food. It is hard not to make it better than what the takeaway has to offer (greasy, MSG-y – you know the gig). Equally, it is not as bad for you as the name may sound (unless it is entirely deep-fried). My chicken and prawn egg fried rice recipe will not win awards for presentation (as the above clearly depicts), and I’d struggle to find a way to make it look like something designed vs. thrown together. There is not much frying going on either as just two tablespoons of groundnut oil is enough for a meal big enough to serve 4 hungry soul. Not too shabby. Each time I make it, I alternate ingredients and have never had it the same. I always double the quantities and devour the rest a couple of days later. I am also making no claim to authenticity – is it really Chinese, or influenced by Asian flavours in general? Finally, what I love about this style of cooking is that all the prep can be done in advance, as cooking time is really rapid. Line up all the prepared ingredients in the order that you will need them. In a small bowl, combine a tbsp of soy sauce, saké, honey, chilli sauce and grated garlic. Mix thoroughly and add the sliced chicken breast. Cover in cling film, and leave to absorb the flavour for as long as you can (within reason ;o) - 1 hour + is a good length of time). Whop out your wok, and get it hot (I use a medium high heat on my induction hob - 6/10). Add 1 x tbsp of groundnut oil. Add the beaten egg, and swirl it around the base of the wok so that it is very thin. Give it a few seconds (it takes very little time at all) and flip it over to cook the reverse size. Remove the thin omelette and set aside for later. Once cooled, chop it up into thin strands or small cubes. Add the chicken breast, chopped chilli and stir-fry for a couple of minutes. Then, add the spring onion, carrot, diced red pepper and red onion, and stir-fry for 2-3 minutes until the ingredients start to brown through. 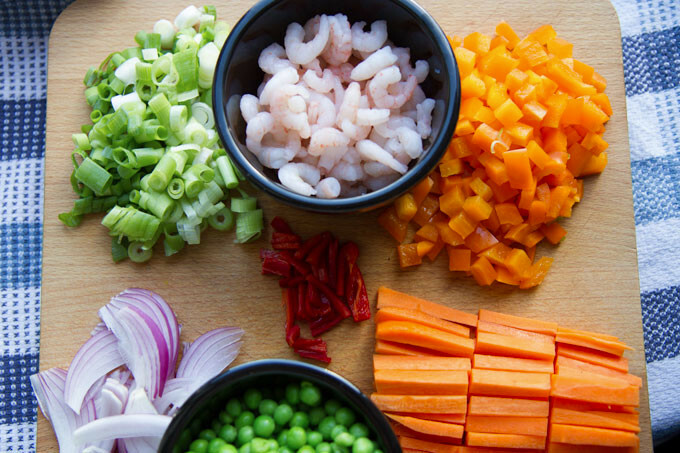 Add the prawns and peas and cook for one minute, make sure all the ingredients are mixed through, and remove from wok, put in a medium sized bowl and set aside. Add the final tbsp of groundnut oil to the wok, and add the rice. Press the rice down and cook so that it is lightly browned on one side (but not cremated!) Turn the rice over and brown the other side. Add the final tbsp of soy sauce, and stir-fry until warmed through and return all other ingredients - including the egg - to the wok. Mix through thoroughly, and keep stir-frying for a final 2-3 minutes until cooked through. Serve up (if you can make it look better than a pile of stuff on a plate, you are doing a lot better than me), dig in, and devour. I’m so stoked to have found this website. This recipe was great…really accessible with simple, fresh, realistic ingredients written in a really nice way. The presentation and lay out of the website is fabulous and the touches of humour are so refreshing and true. Thank you for your time and effort, I’ll be using you again! !